The discovery of Central Oregon’s amazing quality of light drew this artist to Bend numerous years ago. Although preoccupied with child rearing for many of those years, she now devotes much of her time to painting that stunningly beautiful light so prevalent in the landscape of the Cascades, Ochocos and the high desert plateau . 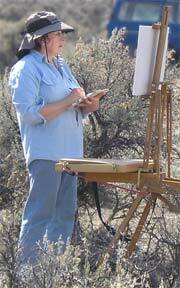 Love of the outdoors, plus the spontaneity of painting in plein air has influenced her current direction. Linda works in pastel, watercolor, oil, acrylic and any other media that captures her imagination, continually searching for the radiance, which inspires her paintings and drawings when on location. In addition, she has found great benefit from artistic ‘cross-training’, not unlike an athlete, by changing-up media, working in-and-out of a studio, regular figure drawing, photography and website design. From an early age, Linda was fascinated with mechanical banks, whirligigs and mobiles. With web design, Linda melds her interest in design with the interactive. Web sites, she feels, should reflect the character and personality of the person or the organization for whom they are built.